Lately there has been a good deal of discussion at my school about publishing our grade books online. There are some, like myself, who publish their grades online for students and parents to access. Others I teach with have deep reservations about giving this kind of real-time access. I tried to think back, way back to the day in 2001, when the Principal at my Junior High said that we would be publishing daily assignments and grades for students and parents to access. I tried to remember if I too felt scared. I wondered, was I worried or concerned? Did I have the same apprehension back then that my colleagues seem to feel today? If a grade book is put online will the student be taken out of the communication loop? Parents will look at grades rather than discuss the grades with their children. Students will no longer be responsible for communicating their progress to their parents. If a grade book is put online will parents check the portal too often and put undue pressure on their child? Our students already feel pressure. This will only heighten the pressure on our stressed out students. If a grade book is put online are we breaking Germany data privacy laws? Is the data safe? How will people access it? Can the system be hacked, leaving the community exposed? All of these issues are of great concern as German privacy laws are very strict. If a grade book is put online, are we taking the teacher out of the communication loop? Parents will no longer discuss with the teacher the child’s achievements. Students’ grades will be reduced to individual assignment numbers, rather than a teacher’s judgment about the child’s progress over the semester. The teacher would no longer be seen as the qualified interpreter of the student’s overall growth. If a grade book is put online will parents begin to unfairly compare teachers to each other? Will parents begin to question teachers’ pedagogical decisions? For example: Teacher A published 20 grades for the semester and Teacher B only published two grades. Teacher B will be ostracized for not teaching his/her students because there are so few grades in the grade book. Parents will assume nothing goes on in that class, where as Teacher A’s class is getting the full treatment. Teacher A meets her students 5 times a week, while Teacher B meets her students only 2 times a week. A parent would not be able to understand that Teacher A’s subject is different from Teacher B’s subject. One course has multiple units with multiple assessments over the course of a semester. The other course has only 2 large projects that develop slowly over a semester. If a grade book is put online, where will the task of reporting end? 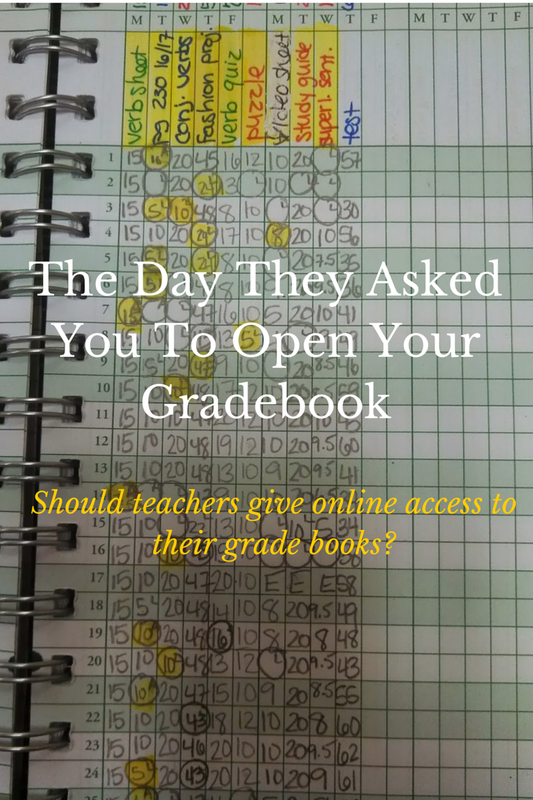 24/7 access to a grade book may make parents and students think they have 24/7 access to their teacher. Reporting would be expected to be a daily or a weekly occurrence. To be honest, I can’t remember what I thought on that fateful day when SchoolMaster was rolled out at my Junior High. But I do remember my frustration when moving to Europe, when I realized I no longer had a way to show my current grades online to my students and parents. For me, an online grade book was a part of the daily life of teaching. I no longer had to print off progress reports and have them signed once a week. I didn’t have to call home every time an assignment was missing. And when a parent wanted to meet with me to say that I hadn’t kept them up to date with their child’s progress, I could remind them that they had access to their child’s assignments and progress at all times. I get it. I get my colleagues reservations about opening the grade book. What we do as teachers is an art. We create activities, empower young minds, and expose them to the world of learning. When we show our grade books to others, there is that chance that our work will be misinterpreted. Yet there is also that chance that having our work out there for all to see will create a new kind of conversation: conversations around the dinner table about Life in the Trenches during World War I; conversations on the commute home from school about the wonders of Pi; conversations out on the running trail about how today their child has decided to become a painter. We might actually create a more positive atmosphere for students, parents, and teachers. We might be able to work as better, more informed team members to help our young scholars achieve their goals. Do you use an online grade book? If you are a parent, do you find online grade books useful? I’ve watched the battle for opening the gradebook evolve in a few different international schools. Personally, as long as there are parent workshops about the move’s rationale and ‘dangers’ of student/parent obsessing, and as long as there are reasonable time windows in place so a teacher doesn’t feel over-burdened to get the scores into the system immediately….I think it’s a good thing. Kids deserve to know what their current grades are, and how those grades were figured–just as a patient deserves to know what is in his file and what the analysis says. This way, kids take ownership and have time to improve the grade in the areas which are weak before the semester finishes. Wise words. We need to do more to educate our parents. They want to be part of the process and often we don’t tell them how to be more of the process. I have always felt that if the grades are out there…the ownership is no longer on me. We can do so much more to empower them to use their own data to improve their work/study habits. I used engrade.com while I was teaching in China, but we never fully rolled on the online access to parents and students. I did tell them that they could always email a request for a grade print out at any time. We were always worried about undue stress being put on the students and the comparison between courses. Since I’ve moved to Venezuela I’ve used EasyGradePro and now my new school is trying to use the standards based grading system with Skyward (not quite set up yet though). The plan is that parents should have online access to the grades by January. I will let you know how it goes. Good luck with your endeavors in Venezuela. Ultimately, I think it is a good thing. It is creating a grade book that works with Criterion grading that is difficult. Hopefully our school will find one that we can all agree on. I’m 14 and my parents check my online grade book, but they check about once every week or so, which is fair enough. They aren’t helicopter parents and if my parents did check that much I probably would change the password often. I think it’s fair to have grade book as long as parents don’t obsess. It would be a good idea to make it limited so parents can only check once a week so they don’t obsess but still are aware. Great points Ryan. We want parents to feel in the loop, but at the same time the grade book shouldn’t be something they obsessively check. Thanks for your comments.